Lies picks up right where Secrets ended. You remember the ending, right? Your jaw hit the floor and you had a thousand thoughts running rampant in your head; “Did she know”? “Is she lying”? How could she not know’? 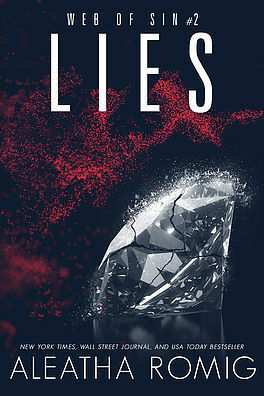 I thought Secrets was amazing, but I loved Lies even more. Not only is the chemistry between Araneae and Sterling explosive, but the growing mystery and intrigue keeps me on the edge of my seat. As more players are introduced into the mystery of Araneae life/death the plot thickens, and we are left wondering which version of the truth is real. Does Araneae truly possess the missing pieces. As with most of Aleatha’s dark work, I feel like the more information she provides the more twists and turns await us. I’m not so patiently awaiting Promises. You must read these books in order Secrets, Lies and Promises (releasing in January 2019).